Hide deals from seller "USA Athletic Club & Spa"
Hide deals from category "Gyms & Fitness Centers"
Limit 1 per person. Valid on a 1-month individual membership. New customers only. Not all services available 24 hours a day. Promotional value expires 60 days after purchase. Getting in shape requires endurance, a balanced diet and creative ways to burn calories without burning up all the cash in your bank account. 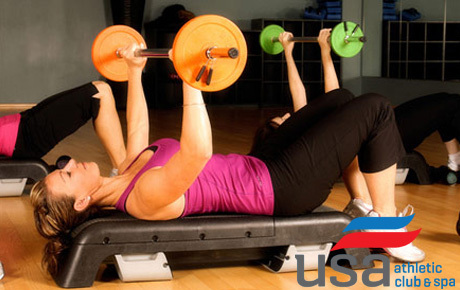 Let the calorie-shedding begin with this deal for 50% off a 1-month gym membership at USA Athletic Club & Spa in Aurora ($60 value). Open for business for five years, USA Athletic Club & Spa has helped a host of clients slim down, tone up and get healthy. With state-of-the-art workout amenities and services including personal trainers, free childcare for members, massage therapy and a juice bar, all of your family’s fitness needs can be met in one place. Hit the invigorating swimming pool and take advantage of group exercise classes including yoga, spinning and Zumba. Aurora’s premier 24-hour athletic facility with activities for the whole family.